Breathtaking mountain valley vacation home for smaller groups up to 3, couples and solo travelers: The Crazy Mountain Ranchcabin in the CRAZY MOUNTAINS (Rocky Mountains). Our beautiful nearly 400 sq. ft. ranchcabin on the Hailstone Ranch is the perfect retreat for guests looking for a cozy and very unique place where you can feel at home immediately. The right side of the building is the vacation home with an own garage on the left side. The RC lies within our protected ranch house area with a separate entrance and private deck. It has a fully equipped kitchen with rock walls and a comfortable bathroom with a round shower. Benefit from the great advantage of complete privacy and the possibility of a quick contact if you like to come for a relaxed chat. 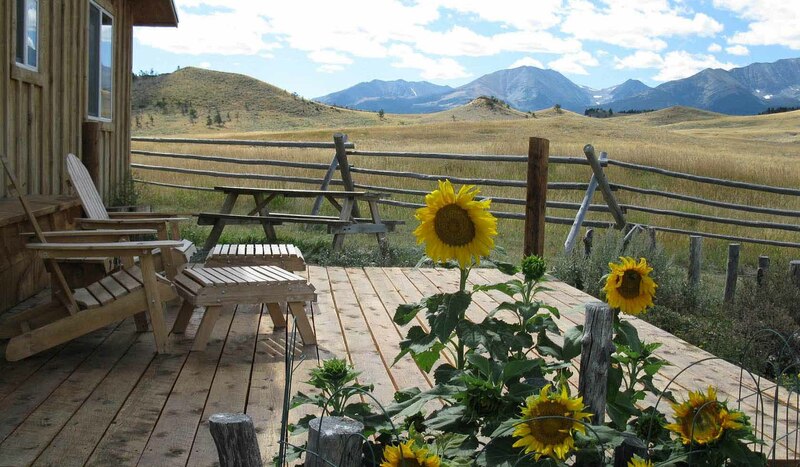 The ranch cabin is a secluded getaway, very quiet with a breathtaking view to the mountains. The one and a half rooms are all open with three places to sleep (one queen size bed and a full size pull-out sofa). Enjoy Montana's beautiful log furniture, a combination of the Old West with modern elements. The interior is very charming, unique antiques and new handmade furniture creates an amazing comfortable atmosphere. More than 11,200 acres private ranch property invite you for the best hiking tours you've done in your life. The Big Timber Creek, only about 1.5 miles away from your ranchcabin, has so many beautiful spots that you can spend days of pure relaxation there. The mountain water is clear and fresh with healthy trout. Take a picnic chair with you and sit at our breathtaking private water fall hidden between rocks and firs. The cabin has a private deck with garden furniture. Enjoy grilling outside, or take advantage of our hidden trails in the mountains and on our property. There are no other guest disturbances because you will be the only guest besides our second cabin, the Crazy Mountain Hideaway Cabin, about four miles away. There are so many things you can do. We love to support you, so that your stay will be pleasant and memorable. We know all the great places where to go: Yellowstone Park is about two hours away. Visit a secluded ghost town, take a hot bath in a sulfur spring, enjoy a rafting tour on the Yellowstone River or follow the tracks of Redford's film "The Horse Whisperer" that was shot in our area.